One of the most unique and memorable ways to travel into Laos from Thailand is to take a slow boat on the muddy Mekong River from Chiang Khong/Huay Xai to Luang Prabang. Rather than trying to coordinate the border crossing and boat rides on my own, I decided to go with an organized tour (the Thailand to Laos Adventure by G Adventures) and let them figure out the details. This stretch of my trip through Southeast Asia was interesting, peaceful (maybe even a little boring at times), but certainly an adventure I will not forget. We left our guesthouse in Chiang Khong early in the morning, loaded our baggage onto a tuk tuk which took us to the Thailand customs office. 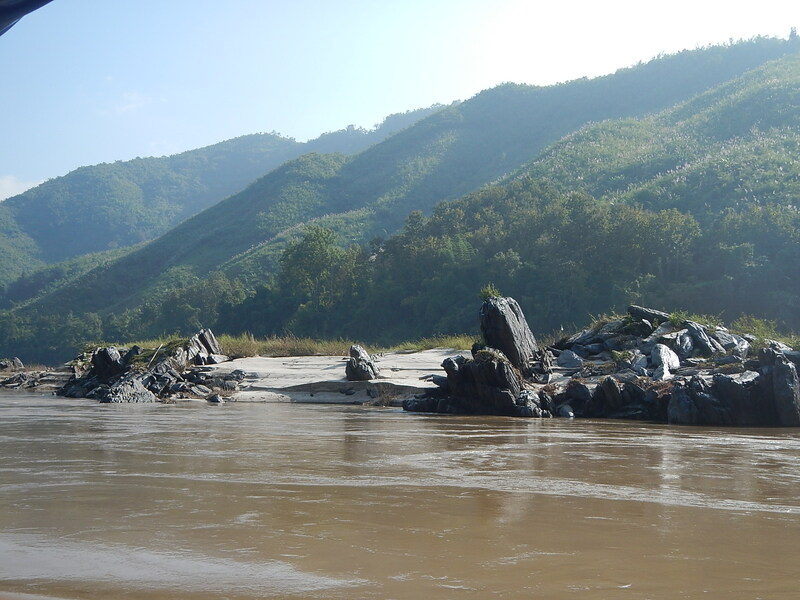 The border crossing location was brand new, but somewhat inconveniently located a few miles downriver from Chiang Khong. After exiting Thai customs, we crossed the bridge to the Laotian border station where we received our Laos visas on arrival ($35 USD) arranged through our tour guide. Once we cleared customs on the Laotian side, we had to drive 10 kilometers back all the way back to Huay Xai just opposite Chiang Khong on the other side of the river. There, we boarded our slow boat. If you happen to be organizing this trip on your own, make sure you aren’t using outdated information! The friendship bridge connecting the two customs stations was only completed in December 2013. Crossing the river into Laos was like traveling back in time. Chiang Khong, on the Thailand side, is a modest town, but Huay Xai even more so. I noticed the Laotian flags, hammer and sickle flags and tiny taverns selling Beerlao. Our slow boat was run by family who lived on board: husband, wife and baby. They sold Beerlao on the boat and you could snack on bananas or chips. For a lot of the journey, we played card games, read books, chatted with each other and admired the scenery from the boat. If you’re making this journey during the winter months, as I did, I would advise taking some warm clothes or even blankets with you. I made the mistake of assuming that Southeast Asia would be hot and didn’t initially bring cold weather clothes with me. Sitting on the boat exposed to the wind all day long can definitely be uncomfortable. Overall, we were pretty fortunate because our small tour group of eight made up the only passengers on the boat. From other blogs I’ve read, some of these boats look like they can get really crowded! 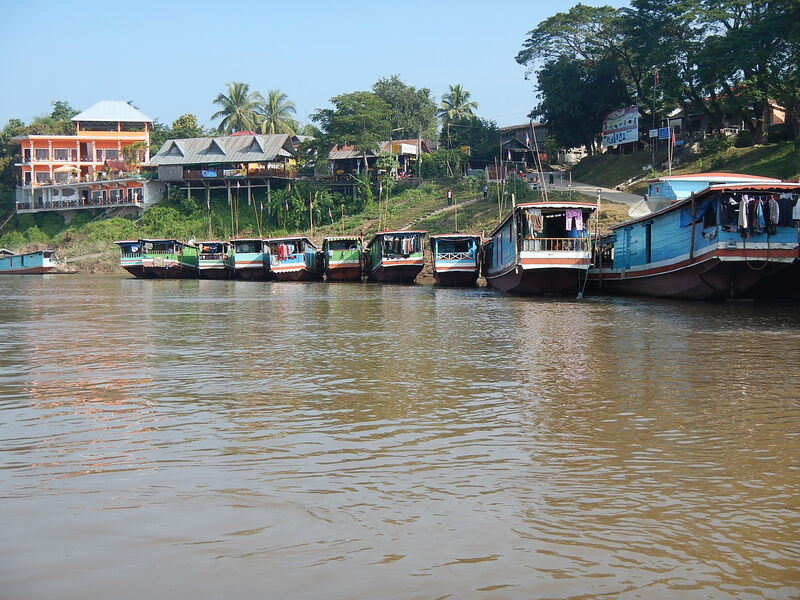 While the journey to Luang Prabang takes two days on the slow boat, I noticed speedboats whizzing by down the river. Although this seems to be a quicker way to travel the river, these boats are quite dangerous and tourists are frequently injured or even killed using this method of travel. With all of the rocks scattered in the Mekong, I’m not surprised. The muddy Mekong winds its way into Laos flanked on either side by verdant, jungle-covered mountains, dotted with primitive looking huts and settlements. 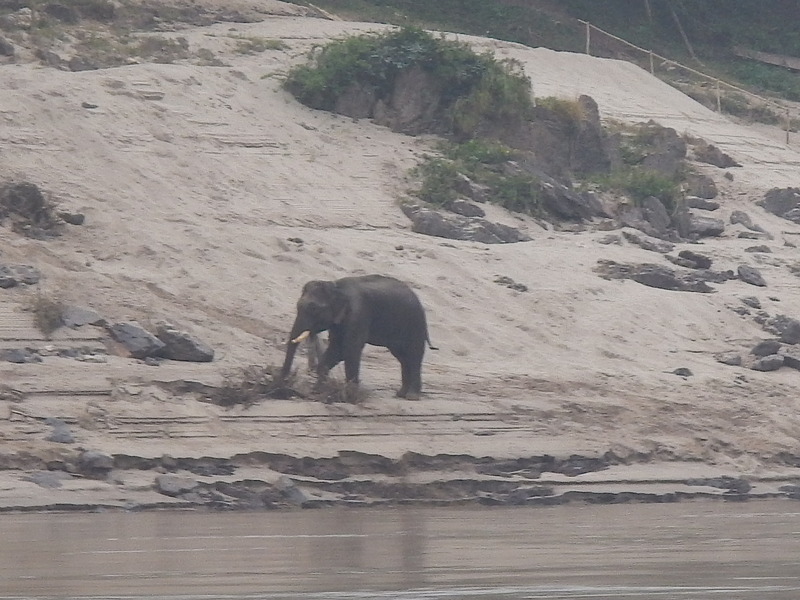 Now and then you would an elephant walking along the banks of the river. Near the end of the day, the setting sun makes for some spectacular scenery in the flowing waters. 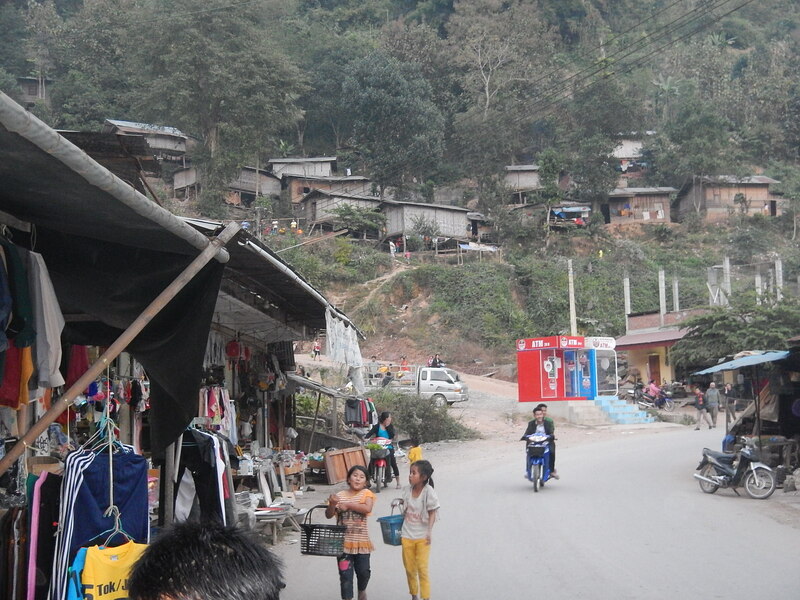 The first leg of the journey ended in the small, but developing village of Pakbeng, an impoverished yet beautiful settlement on the banks of the Mekong. 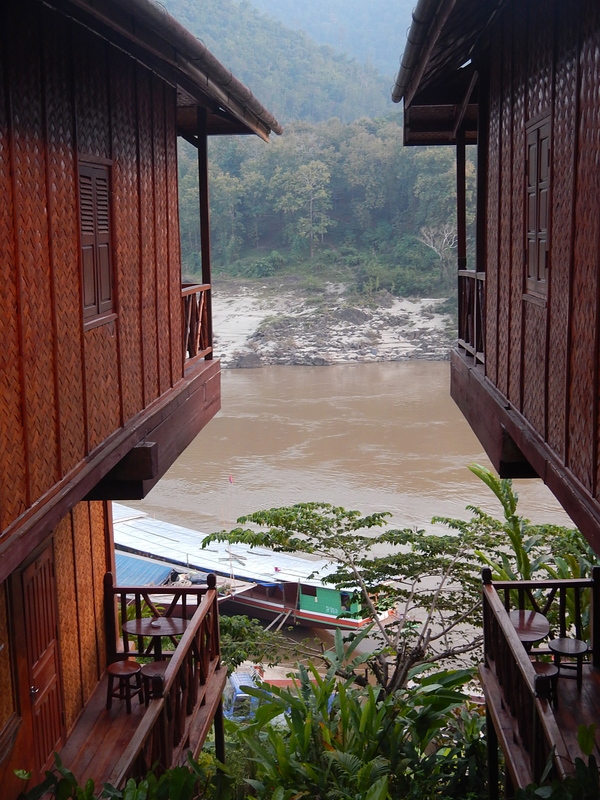 Our accommodation was a beautiful guesthouse up on the hill overlooking the river. In the evening we took a walk through the town led by our Laotian tour guide (our Thai tour guide told us that she actually was not able to officially “guide” us while in Laos due to Laotian tourism laws). We stopped at a market and ate at a surprisingly modernly decorated restaurant where we enjoyed some traditional Lao laap, a delicious blend of minced meat, lime juice, herbs and sticky rice. Pakbeng looked like it certainly had the potential to become the next touristy hotspot, and it probably sees its share of tourists traveling by boat between Thailand and Luang Prabang, but on my visit, it still felt somewhat undiscovered, serene and authentic. In the morning, we also witnessed a few orange-robed monks collecting alms. It was interesting to watch this ritual in Pakbeng, where you don’t have crowds of tourists taking photos as you do in Luang Prabang. On the stretch of river between Pakbeng and Luang Prabang, our slow boat stopped at the Pak Ou Caves, an upper cave and a lower cave inside a cliff overlooking the river. 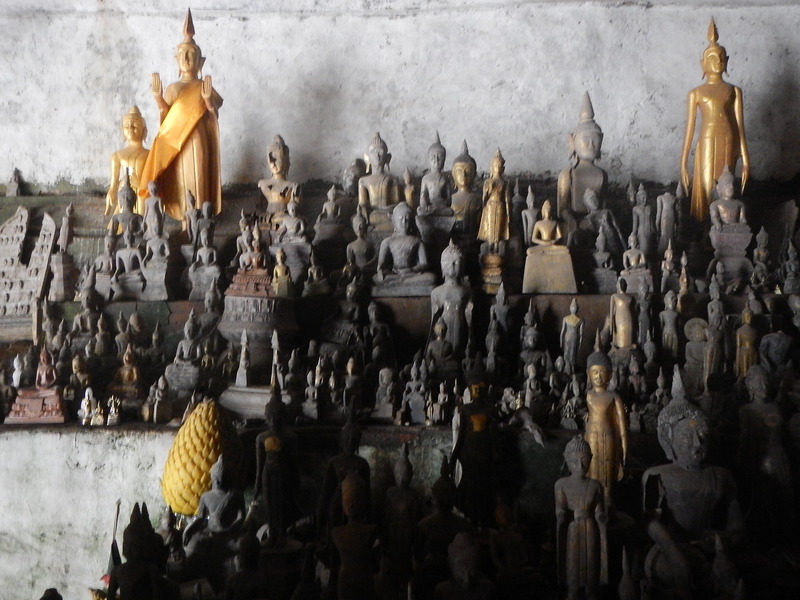 The caves are filled with thousands of statutes of the Buddha in various poses, left there during any time within the last 300 years. Locals continue the tradition of leaving Buddha statutes here. It is believed that the caves were first a holy site for the worship of Phi, a god of nature worshipped by the Lao people prior to the advent of Buddhism, adopted by the Lao royal family by the 16th century. 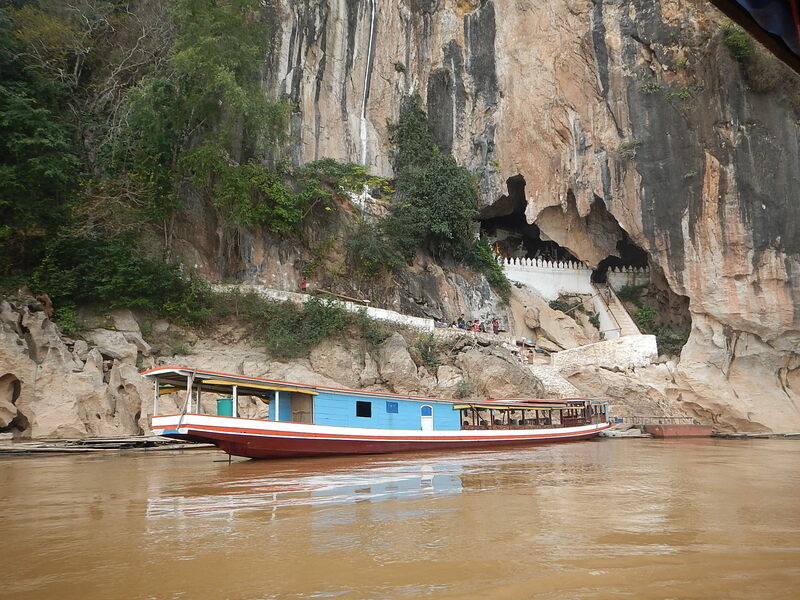 The caves served as the destination of an annual pilgrimage from Luang Prabang for the New Year. From the caves, it was 25 more kilometers to Luang Prabang, where our long two-day journey on the Mekong came to an end. While the trip took a long time and could at times be a little monotonous, it was a fascinating introduction to the country of Laos. Because of the long stretches, it was definitely an advantage traveling with a group so I had people to talk to, play games with, etc. Overall, I am very happy that I had this experience and would recommend it as a way to introduce yourself to the enchanting country of Laos. 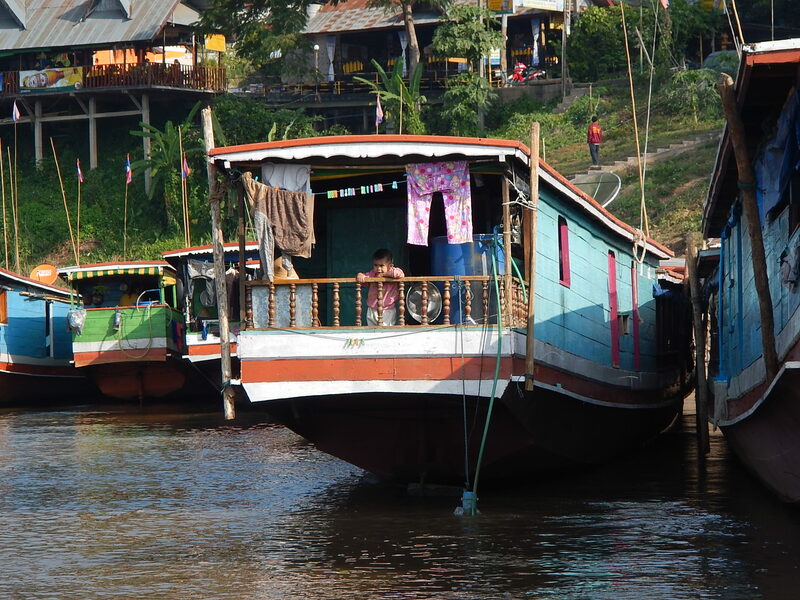 Have you taken the slow boat on the Mekong River into Laos? What was your experience like?